And not a minute too soon!!! 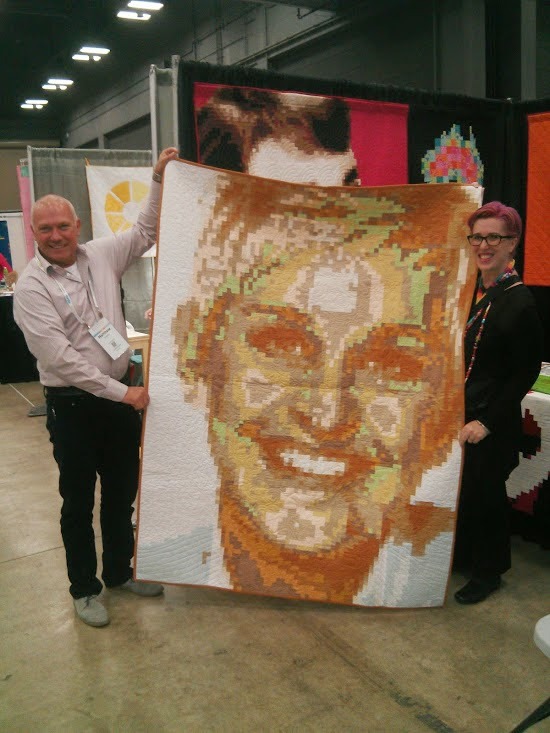 I'm a tad late in posting about QuiltCon as we didn't get home to Melbourne until the 28th Feb and since then I have been suffering jet lag, a nasty head cold and a severe case of procrastination-itis! 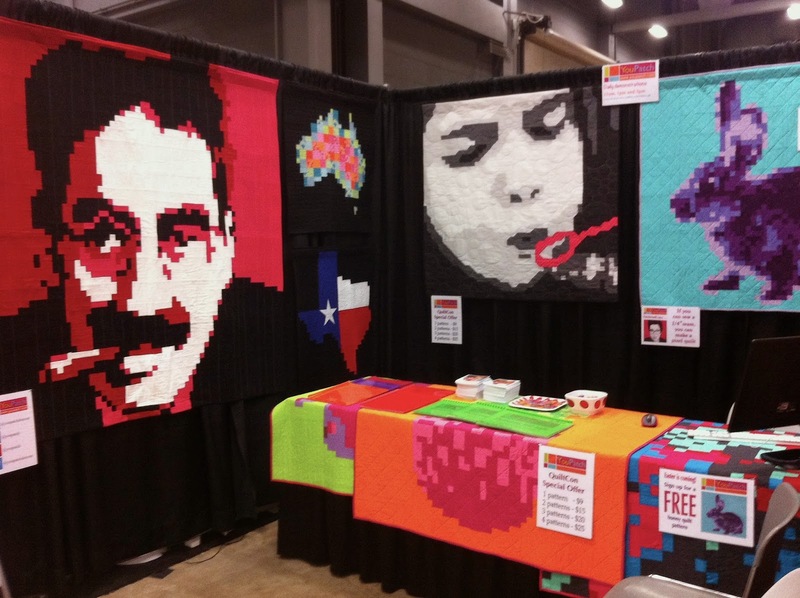 So in this first blog post, I'll be mainly showing you our YouPatch booth. We were so proud of our booth that packed away into a suitcase! But more about that later. 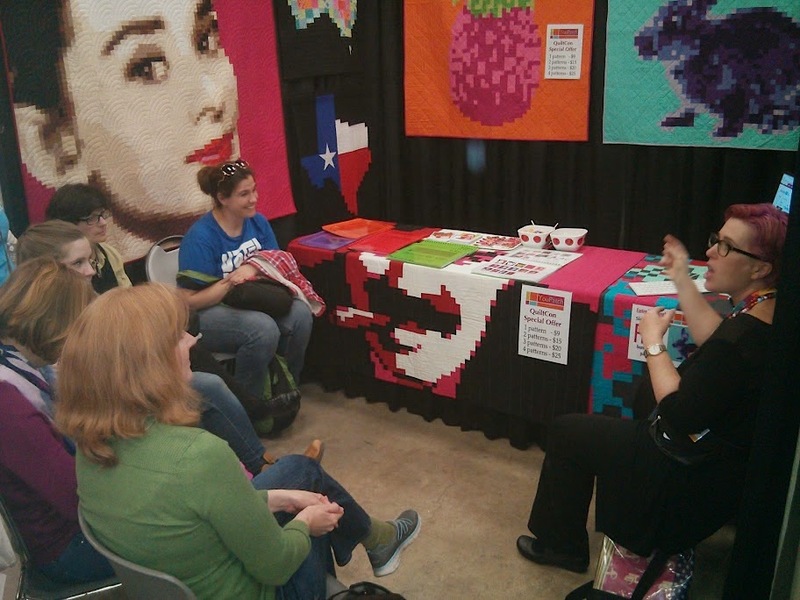 In future posts, I'll be talking bout the people of QuiltCon, the city of Austin and, of course, all the gorgeous quilts!!! I'll also be showing you our post-Austin visit to Los Angeles where we got to hang out with a bunch of fabulous people and soak up the winter sunshine. But first, our journey to Austin ..... didn't go exactly to plan! 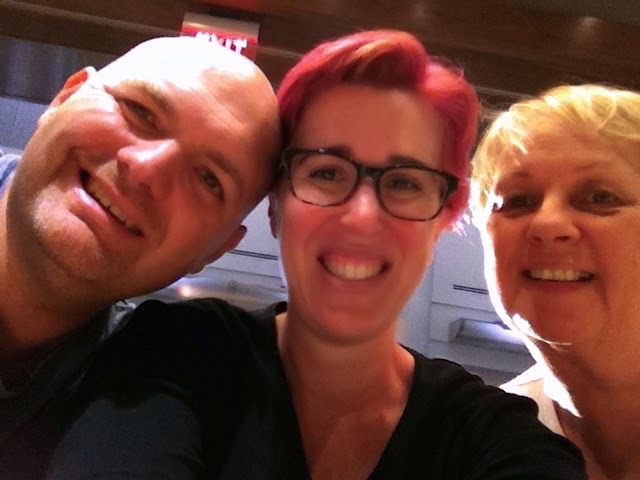 Here I am at Los Angeles Airport (LAX) with Dan and the lovely Jen Kingwell. 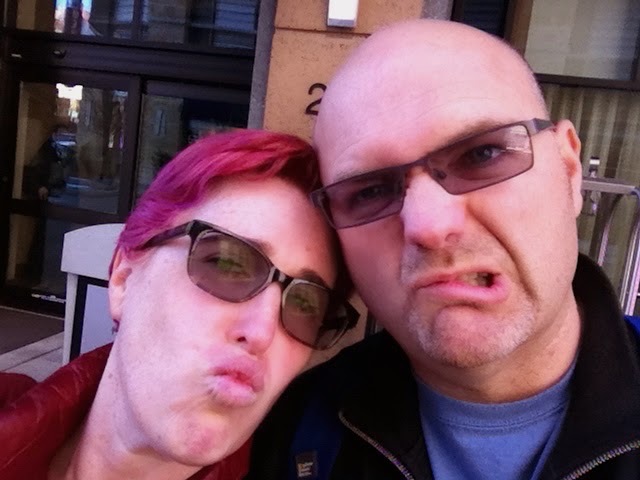 We had travelled together on a 15 hour flight from Melbourne expecting a couple of hours wait before boarding a flight to Austin. Unfortunately, our flight was delayed and delayed and delayed. This photo was taken after waiting for nine hours in the terminal only to be told that our flight would now be leaving at 5am TOMORROW and that we would be staying in Los Angeles overnight. After a 24 hour delay (and plenty more not-so-delightful mishaps from American Airlines. Grumble, grumble!) we finally arrived in Austin and even found our luggage!! It was great having Jen for company (as well as Dan of course) as it made the LOOOONG journey so much more bearable. Thanks Jen!! Finally arriving at our hotel after a very long two-day journey! 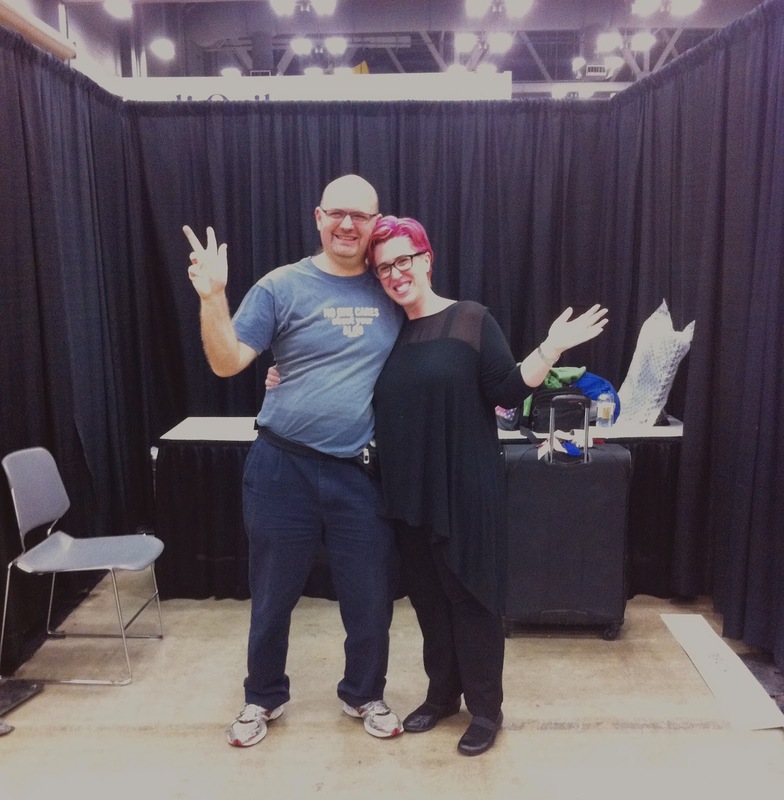 So our original plan had been to arrive in Austin on Monday and spend the rest of the day recovering and sleeping before a big day of shopping for the booth on Tuesday. BUT, due to our delay, we arrived lunchtime Tuesday and had to head straight out to get the shopping done. Thank goodness for wonderful Aussie friends with a car!!! Sheridan (who's blog 'Chalet Girl' seems to have disappeared.... but she can be found happily stitching away with the GWS MGQ) and Lorena very kindly helped us shlep from store to store so we could buy a computer screen, hanging rods for our quilts, folding chairs and even candy bowls with candy to fill them! Wednesday was set up day at the show. 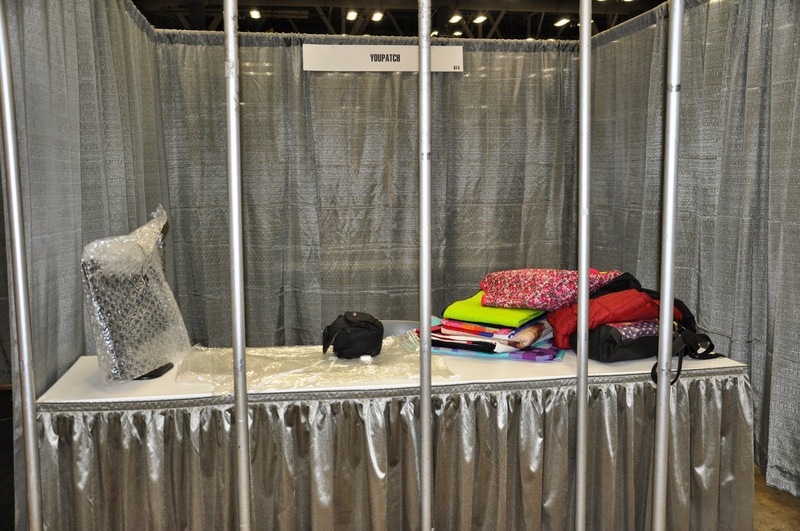 There was a frenzy of activity as other vendors and exhibitors were building their booths from large crates that had been shipped in to the venue. All we had was a suitcase full of quilts (and stuff) and whatever we had purchased on our shopping trip the day before. Luckily, our booth came together very quickly and easily! Here I am steaming 'Audrey' to remove her wrinkles after being cooped up in a suitcase for so long. 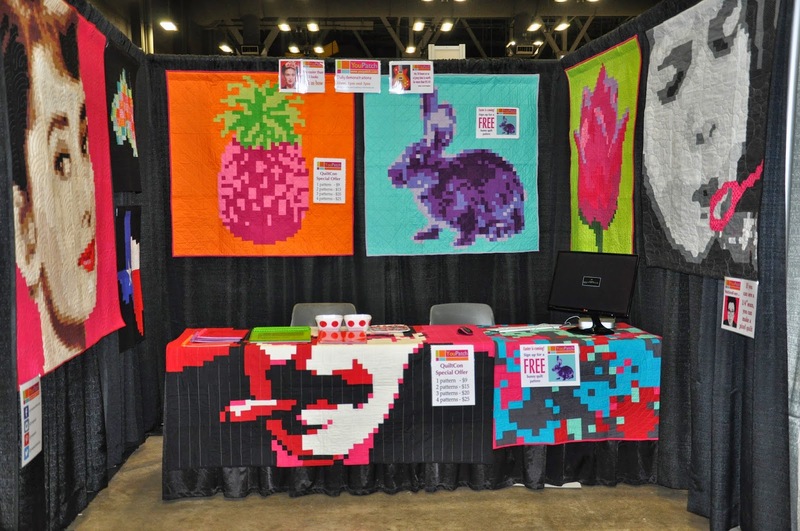 We were lucky enough to have two YouPatch customers (both from Vancouver) bring their pixel quilts along to include in our booth display. 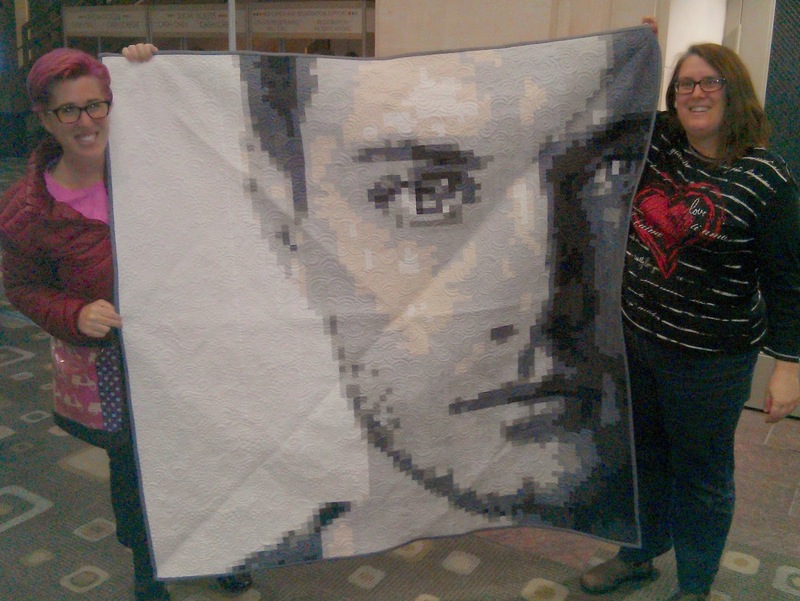 And Stacey also brought us a quilt to display. She is a crazy fan of the show Supernatural. This is Jensen Ackles who plays the character Dean Winchester. It was a VERY popular piece at our booth. You could really pick the people who watch Supernatural. They were VERY excited!! 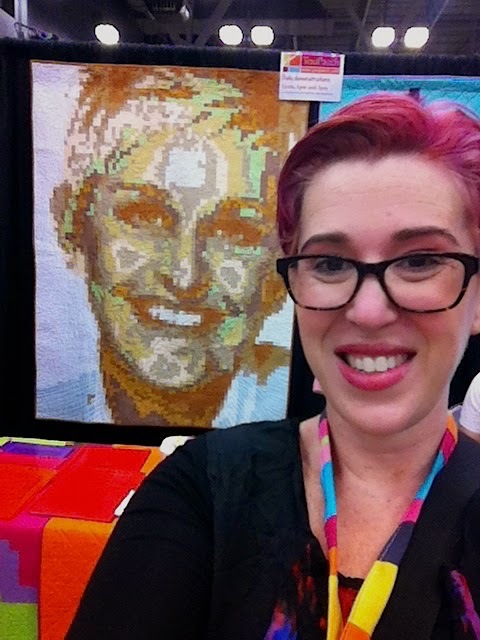 Stacey also had a quilt in the quilt show. It is a companion piece to this one. It is of Jared Padalecki who plays Sam Winchester. 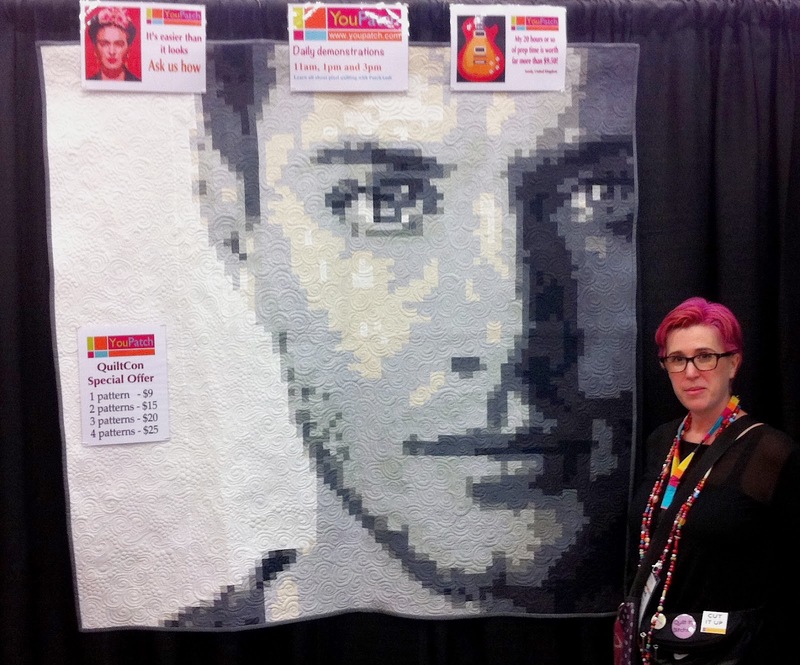 I'll show you that one when I do a post about all the quilts in the show!! We had more quilts than wall space so we decided to change the display each day. 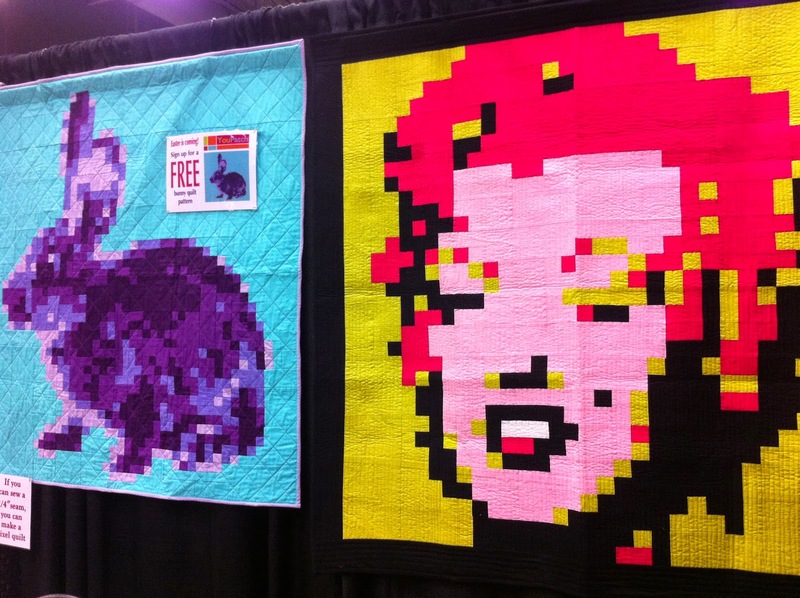 Here are some more of the quilts we showed. We were really proud of the booth and, considering we didn't have a massive specially built rig to display, we think it looked great! We gave demonstrations of the website three times each day and had a chance to meet many great people but I'll tell you more about them in my next blog post. So that was our booth. After four wonderful, exhausting, inspiring days, we managed to pack the booth up in 25 minutes ... much to the envy of our fellow vendors! Can't wait to tell you all about the other great stuff at QuiltCon but for now, it's nearly midnight, so I'll sign off and see you all again soon. Great booth Andi the quilts look fabulous. Look forward to seeing and hearing more. It was an adventure Andi and Dan. Thanks to you too for your company. I'm so pleased it went well and you were so busy each time I passed. Really happy for you noth. Can I have that de - wrinkling treatment you gave Aud? Your booth looks awesome Andi!! Can't wait to see your next post. Such a great post and so many lovely memories came flooding back here when I read it! Best week EVER!!! 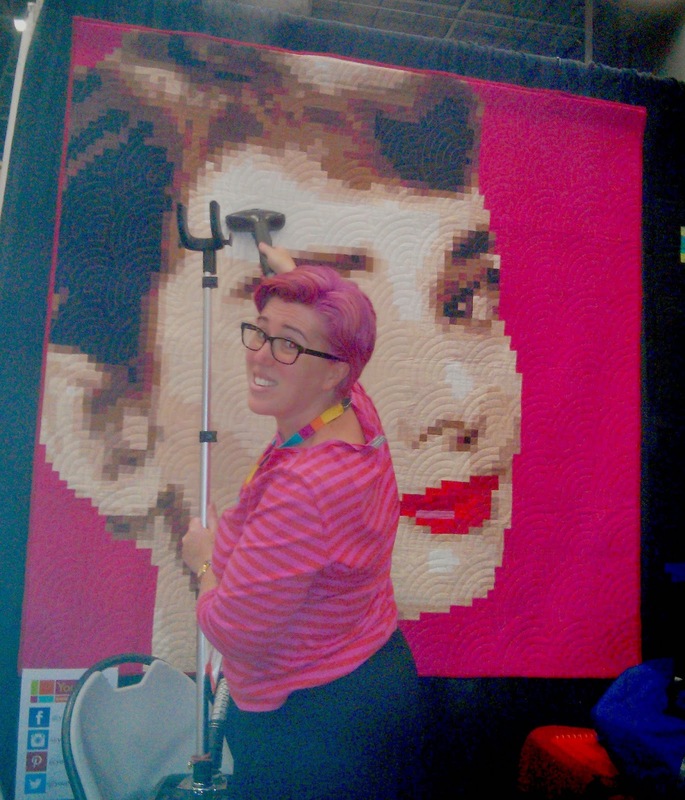 QuiltCon - meeting all the quilty people! !